Tesla will release a new Autopilot system later this month. The Tesla Model S and Model X electric cars are in for interior redesigns. A Chevy Volt owner takes a look at the Honda Clarity Plug-In Hybrid. And what Tesla's recent stock price jump means for short-sellers and the company. All of this and more on Green Car Reports. Electric-car maker Tesla announced Wednesday it will roll out a new Autopilot system with more self-driving capabilities later this month. New optical software should improve safety, too. Both the Tesla Model S and Model X electric cars are reportedly in for interior redesigns. Those who like the Model 3's spartan look should find the new designs pleasing. 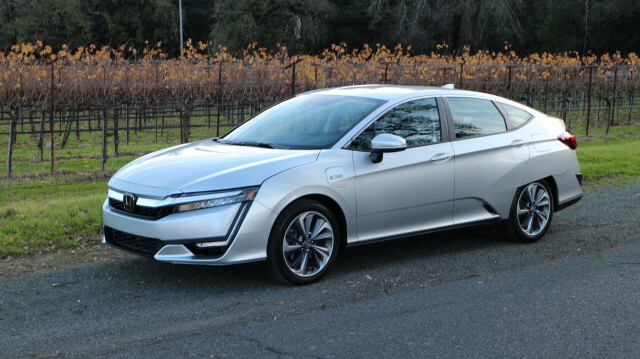 A long-time Green Car Reports contributor who owns a Chevy Volt weighed in with his first impressions of the Honda Clarity Plug-In Hybrid to see if it can match his Chevrolet Volt's electric range and driving experience. Did Tesla's stock surge save Elon Musk? We break down what the jump means for short-selling skeptics (it's not good) and the company itself (better). Bentley plans to mark 100 years of operation with a book—and it weighs 66 pounds. Finally, GM has filed to exclude the China-built Buick Envision from tariffs. Tariffs could cause the crossover's price to surge up to $8,000.